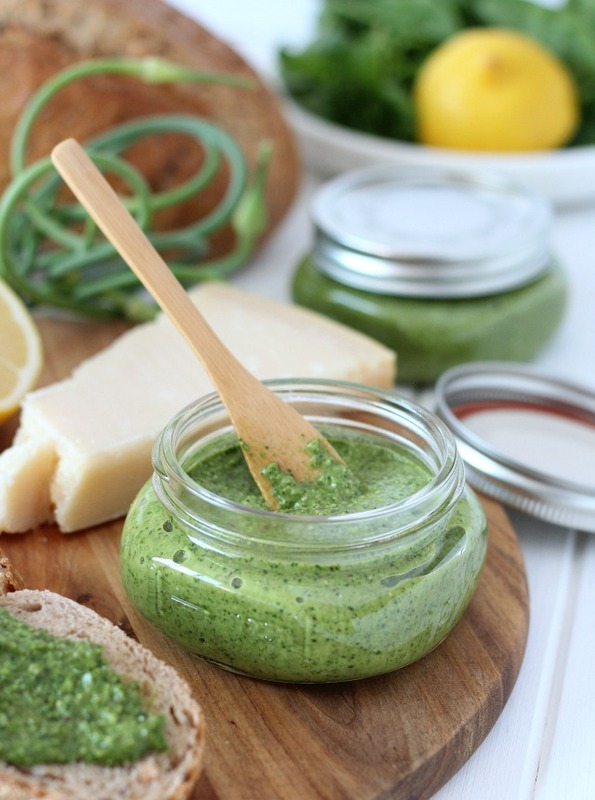 Spinach basil pesto will add a burst of flavour to almost any dish. Garden-fresh and delicious! Hello there! Is your garden bursting with all kinds of green leafy vegetable and herb goodness? Or, do you love visiting local farmers’ markets like I do? If you’re putting your hand up saying, YES, YES, then this recipe is for you! Unfortunately, having a yard on the smaller side means being limited in what we’re able to grow each season. This year, I planted basil, rosemary, oregano, parsley and thyme, along with some spinach and kale in containers. Not much, but it keeps the garden-loving side of me happy until we have more space. In the meantime, there are all kinds of garden-to-table markets around us that make preparing fresh and delicious recipes so fun this time of year. And, in most cases, local produce is bursting with much more flavour, not to mention nutrients, than you’d typically find at a regular supermarket. On our way to a family picnic a few weeks ago, we made a pitstop in a nearby town and picked up garlic scapes from a local garlic farmer. If you’ve never heard of garlic scapes, they’re the flower buds of garlic plants that are removed earlier in the growing season to encourage the bulbs to plump up. Basically, you can use them the same way you’d use garlic cloves in a recipe. I find the flavour to be a bit milder, making them a good choice for uncooked dishes like fresh pesto. 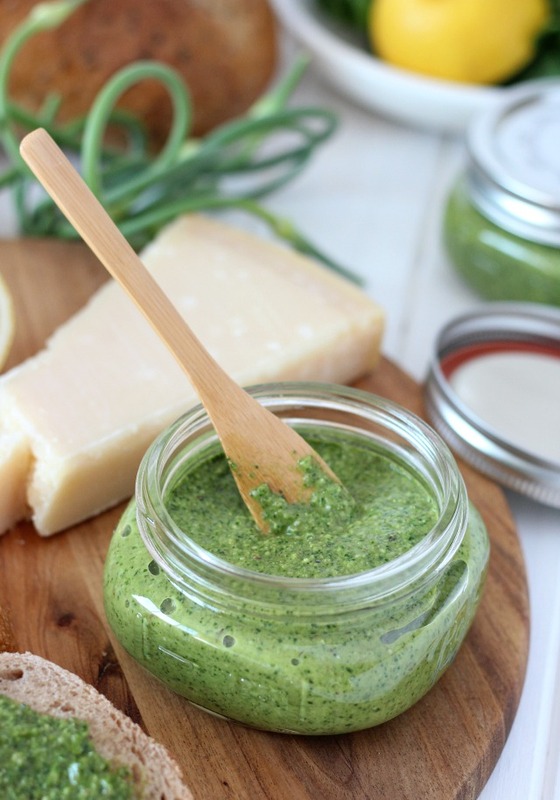 Have you ever made your own pesto? It’s so easy! We enjoy it slathered on bread or crackers, as pizza sauce, or simply tossed with al dente pasta. It’s also delicious spooned over fresh tomatoes, grilled vegetables, chicken or soup. The possibilities are endless. Eat it straight from the jar if you want. No judging here! 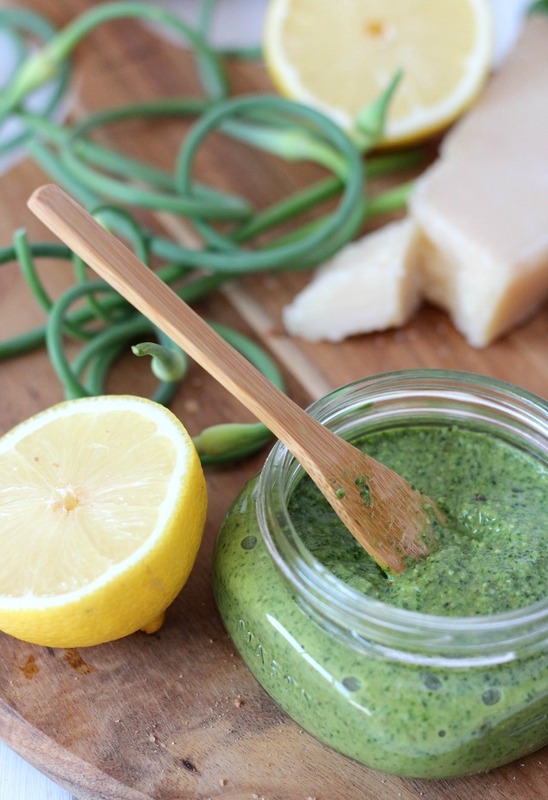 You can use almost any variety of leafy greens and herbs to make pesto. For this recipe, I chose spinach and basil since that’s what I had most of in my garden and I wanted to get to it before the pesky little bugs did! They seem to love spinach, don’t they? And those little aphids are rampant this time of year, ugh! Add both the spinach and basil to a food processor, along with some chopped garlic scapes (or garlic), pecans (or other nuts you prefer), salt and pepper, lemon juice and zest, olive oil and parmesan cheese. It’s really that simple. A powerful blender will work too, but food processors are so handy. I have this KitchenAid one and use it regularly. I like to whip up a double batch and freeze it in jars (I used these cute ones). That way, I always have a quick and easy meal or appetizer option if I’m pressed for time or somebody stops by unexpectedly. And, who doesn’t want a nutritious burst of freshness added to a meal once the growing season is over?! You can also freeze it in ice cube trays to pop into soups, stews or sauces to add flavour. In a food processor (or powerful blender), pulse together spinach, basil, garlic scapes, pecans, sea salt and pepper, lemon juice and zest until coarsely ground. With food processor running, slowly add olive oil through top. Process until combined. Scrape down sides (if necessary), add grated parmesan cheese and pulse until smooth. Store in glass jars and refrigerate for up to one week (or freeze up to 6 months). Makes 2, 250 mL jars. I like to whip up a double batch and freeze it in jars. That way, I always have a quick and easy meal or appetizer option if I'm pressed for time or somebody stops by unexpectedly. 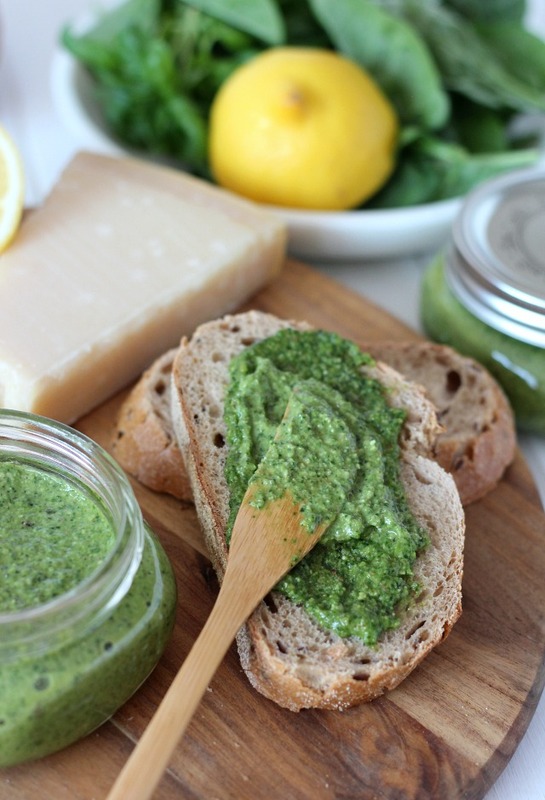 Ready to give this fresh spinach basil pesto recipe a try? It definitely won’t disappoint! I plan on making another batch this weekend to pop into the freezer for later. Now, go and soak up every last drop of summer before it’s over! Love reading your blogs Shauna. So nicely done. You have such great ideas and you’re very inspiring.